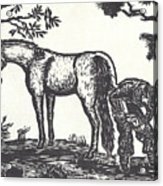 The Farrier Trims Geronimo by Dawn Senior-Trask - 8.000" x 5.375"
The Farrier Trims Geronimo art print by Dawn Senior-Trask. Our prints are produced on acid-free papers using archival inks to guarantee that they last a lifetime without fading or loss of color. All art prints include a 1" white border around the image to allow for future framing and matting, if desired. This is a gem of composition and country living and makes me terribly nostalgic. 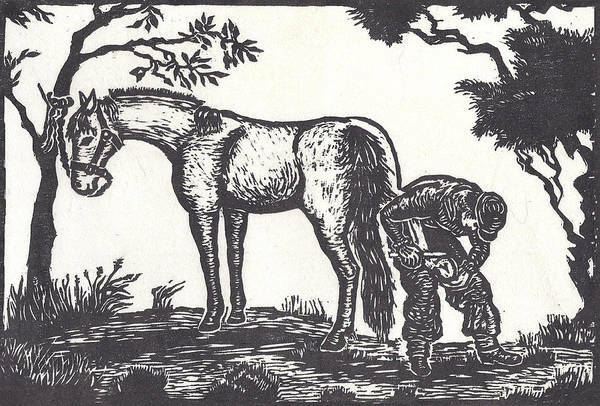 While the farrier was busy trimming Geronimo's hooves and shoeing them, Dawn sketched the scene, then carved and printed this woodcut. 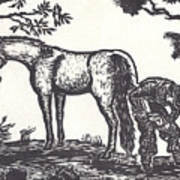 The next time the farrier came out to the cabin to work on the horses, Dawn gave him one of the prints. She hopes it pleased him and his family after he got over his initial embarrassment! This farrier, like most people Dawn knows in rural Wyoming, cobbles together a living doing many different things. 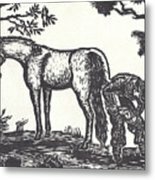 Besides the hard physical labor of shoeing horses, he also raises cattle and fine quarter horses, works as a hand for other ranches, and makes saddles. Growing up in this kind of country, perhaps it's no surprise that Dawn, also, wears many hats -- an artist, writer, horsewoman, artist-in-schools, editor, publisher, illustrator, wife. homemaker and "granny", she just spent the morning pulling weeds in the back pasture and graining the horses.